As a first-year communication major attending the School of Communication’s annual COM Week, the experience was better than I could have ever anticipated. I was given the opportunity to learn not only about graduate school and event planning, but also intercultural communication, political communication and many other selected topics regarding the field. Attending 10 panels was beyond rewarding, and I learned an immense amount of beneficial information. The most relatable panel to most students was the young alumni panel. The young alumni panel was led by past School of Communication students. Among a lot of advice, the panelists told us to always be open-minded about taking advantage of new opportunities and goals. 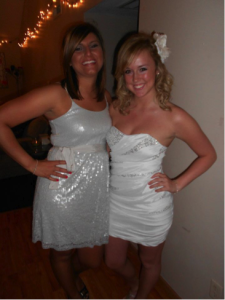 For my article, I decided to focus on Colette Kuk, a graduate assistant. It was her advice that truly resonated with me. Kuk’s recommendation was to be yourself, be truthful and to not burn bridges. The real world is all about who you know and what you make of it. She also stated that finding and following a mentor in your field is very beneficial. Kuk also encouraged us to not to have anxiety about making mistakes at a job because people are very understanding when an employee is new. Yet, she did say that making too many mistakes is sloppy and unacceptable. It is extremely important to proofread absolutely everything, and never take unethical shortcuts in order to get ahead of the game. Overall, it was incredibly interesting to hear from successful graduates who are fresh out of college. It shows us students that, in a few years, we can be just as successful because of our learning experiences in Illinois State University’s School of Communication. The crucial information these panelists shared with the group really helped me better prepare myself for when I graduate next year, and informed me on how to set goals for myself. Of course as a new professional in the real world, I will not be perfect at everything I do, but that is something to work towards everyday. The most interesting piece of advice these panelists gave is to ask questions and be interested in the company as much as you want the company to be interested in you. Networking, building experience and staying positive are great goals that I will always keep in mind. It is extremely important to be respected in the work force. In order for this to happen, I know to dress appropriately, behave professionally and ethically, and focus on how to best serve the company. Overall, my first experience with COM Week was very enjoyable and I am really looking forward to next year! 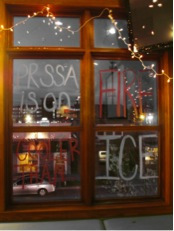 Fire and Ice was the perfect theme for this year’s PRSSA semiformal. 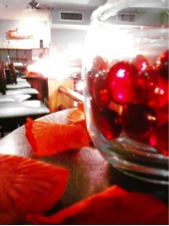 Allyson Corona, Director of Development, suggested the Fire and Ice theme to connect to the semiformal’s Firehouse venue. It was the ultimate combination of opposites. 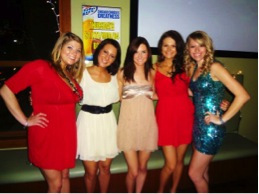 Planning for the semiformal started at the beginning of spring semester. A lot of work went into making sure every detail was covered. 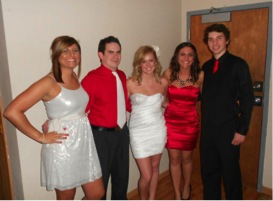 The semiformal committee researched multiple venue options and collaborated to find the best location. Firehouse was the clear winner. After the venue was finalized, all of the other details seemed to fall into place. Member, John Gallagher, led the semiformal committee to decide on decorations. The final decoration decision included white Christmas lights, window paint, candles, rose petals, streamers and red and white roses. The simple, yet classy decorations completely transformed the upstairs of Firehouse to perfectly fit the theme. “We wanted to give a special thanks to Kelsey Carey, Lisa Crocco, Kim Nowlan, Heather Van Buskirk, Genevieve Prendergast, Brian De Pasqua and Bruce Quincy for helping set up and clean up. It would not have been possible to get everything done without their help,” said Corona. While the lights and decorations created a Fire and Ice ambiance, DJ Joe created a fun and inviting atmosphere. “We had such an amazing time from start to finish! We loved DJ Joe and the dancing,” said Development committee member Heather Van Buskirk. DJ Joe played the playlist created by our members as well as a few of his own favorites that in the end, made everyone want to put on their dancing shoes. “It was a great time with great people. It made me realize how amazing PRSSA is and how wonderful these people are. 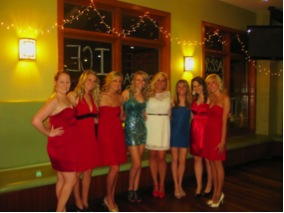 I can’t wait for next year to create even more memories,” said Kim Nowlan, an active member of the Development committee.